CNN observes “Latinos may be ‘future’ of U.S. Catholic Church.” The use of ‘may’ and ‘future’ together in this headline is interesting as few would argue that Latinos do not already make up a very significant part of the U.S. Catholic Church today (as well as historically—predating the existence of the United States in areas of the American south and southwest). CARA often gets inquiries from media, academics, and others about estimating the year in which Catholics self-identifying as Hispanic or Latino/a will likely become a majority of the U.S. Catholic population. Perhaps this is the ‘future’ that the CNN article refers to? CARA surveys estimate that the proportion of adult Catholics who self-identify as Hispanic or Latino/a is 35% and growing. Projecting to a majority is a difficult proposition as there are too many unknowns in regard to immigration, fertility, and self-identity—both ethnic and religious—of future generations. For these reasons CARA has not and does not make such a projection (the Pew Hispanic Center has made population projections based on race and ethnicity through 2050. Yet, these are unrelated to religious self-identification). What is interesting about the combined focus on the Catholic Church, Latinos, and the United States is that it is somewhat narrow-focused. The Catholic Church is a global faith and institution and it often goes unnoticed that the proportion of Catholics in the world residing in Latin America is larger than the proportion of Catholics who self-identify as Hispanic or Latino/a in the United States. Catholics in Latin America will likely become a majority of the global Catholic population before a majority of Catholics in the United States self-identify as Hispanic or Latino/a (that is not to say that Catholics in Latin America self-identify as Hispanic or Latino/a. Those terms, as used in the United States, have unique and specific meanings and histories. It is also the case that many people immigrating to the United States from Latin American countries also do not self-identify as Hispanic or Latino/a. Ethnicity, race, and religion are always self-identified). According to the Catholic Church’s Annuarium Statisticum Ecclesiae (ASE) 2007, there were more than 477 million Catholics residing in Latin American countries (the 20 countries plus Puerto Rico in the Western Hemisphere where Spanish or Portuguese is the dominant language). This represented 42% of the world Catholic population of 1.147 billion in 2007 (for an evaluation of the accuracy of these data see a previous post). The mean center of the Catholic population today is clearly off the continent of Europe and likely sailing somewhere in the southern Atlantic Ocean toward the Americas. The Catholic Church reported in the 2007 ASE that 49.585% of the Catholic population resided in the Western Hemisphere. Sometime between 2007 and 2009, in all likelihood, the Americas became the new population majority in the Catholic Church with those Catholics residing in Latin America making up the biggest share. The size of the Catholic population in Latin America has grown so quickly that the Church hierarchy has yet to catch up. Although it is not designed as a geographically representative institution, only 19 Cardinal electors are from Latin America representing 17% of all electors in the College of Cardinals. Even among all Cardinal electors in the Western Hemisphere (including those in Canada and the United States) only 54% are from a Latin American country. In a previous post, Catholic population data reported in the OCD were compared to survey-based estimates at the state-level. This is replicated here at the national-level for 70 countries where survey data are available. Survey estimates are compared to the Catholic Church’s official population reports in the Annuarium Statisticum Ecclesiae (ASE) 2005. The surveys provide estimates of the percentage of adult respondents in two large international surveys who self-identify themselves as Catholic (see the previous post regarding the use of adult surveys to estimate total population). These surveys include the most recently released wave of the World Values Survey (WVS) for 2005 to 2008, the most recent wave of the Comparative Study of Electoral Systems (CSES) for 2002 to 2006 and the International Social Survey Programme (ISSP) for 2004 to 2006. The survey-based estimates are then applied to total mid-year population estimates for each country in 2005 from the U.S. Census Bureau’s International Data base (IDB). In cases where there are estimates from all three surveys an average of these are used. Although imperfect, these methods are the best available for providing global comparisons. Overall, these surveys estimate that there were 769.4 million Catholics residing in the 70 countries in 2005 for which data are available. In these same 70 countries, the Catholic Church had estimated that there were 883.7 million Catholics (79 percent of the Church’s estimate of all Catholics globally). Thus, the Church’s estimated population for these countries is 15% higher than the aggregated survey estimate. 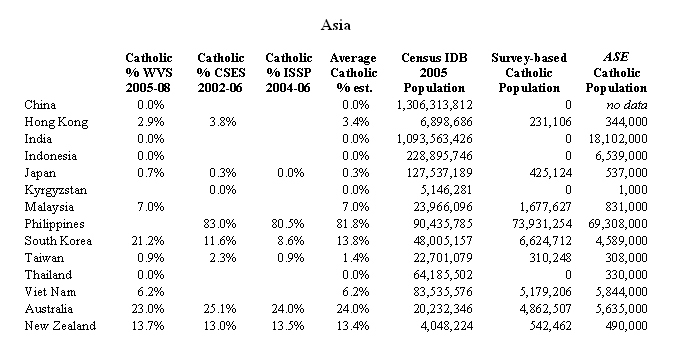 However, as shown in the tables above, the surveys estimate 0.0% Catholic self-identity in some of the countries where Catholics are known to reside in significant numbers (e.g., there are Catholic parishes and parishioners). These include Egypt, India, Indonesia, Iran, Kyrgyzstan, Morocco, Thailand, and Turkey. The Church reports that a total of 25.3 million Catholics reside in these countries—mostly in India (18.1 million) and Indonesia (6.5 million). Catholics are estimated to make up less than 3% of the population in both of these very large population countries. If one removes these 25.3 million from the Catholic Church’s Catholic population total to reflect the survey estimates the Church’s total Catholic population is 11.6% higher than the survey population estimate (858.4 million compared to 769.4 million). Based on the survey estimates, the Catholic Church is over-estimating Catholic population in Europe and the Americas to a similar degree (15% in Europe and 16% in the Americas). 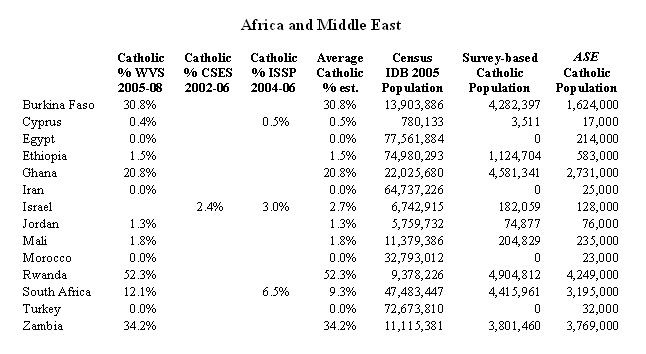 The Church is likely under-estimating the Catholic population of Africa and the Middle East combined (-29%). In Brazil, the largest Catholic population country in the world (regardless of the estimation method), the surveys indicate the Church is over-estimating the number of Catholics residing there by 29 million. How many Catholics live in your state? A recent CARA analysis of data from multiple sources indicates that in most states there may be more Catholics than the Catholic Church is aware of. Each year in The Official Catholic Directory (OCD), dioceses report a variety of statistics—including their estimates of the total Catholic population. The 2009 OCD is intended to be representative of the “status of the Catholic Church as of January 1, 2009.” At CARA, we interpret these data to be reflective of totals in 2008, when these data are collected. Recently some very large surveys regarding religious identification have been conducted which allow for population estimates at the state level. The first of these was conducted in 2007 by the Pew Forum on Religion & Public Life. The U.S. Religious Landscape Survey included interviews with a representative sample of 35,556 adults in the United States. The second source used here is American Religious Identification Survey (ARIS) conducted by researchers at Trinity College in 2008. This survey included interviews with a representative sample of 54,461 adults in the United States. Surveys with such large sample sizes allow for state level estimates of religious identification that are not possible with a typical academic or media poll that may only interview 1,000 respondents nationally. Both of these large surveys estimate the proportion of the adult population (age 18 and older) that self-identifies their religion as Catholic. These surveys likely underestimate the Catholic percentage of the total population—including children—as Catholics in the United States are, on average, younger than the non-Catholics (and more likely to be of childbearing age) and Catholics have a higher fertility rate than non-Catholics (both of these demographic factors are related to immigration). Thus, the percentage of the population under age 18 in the United States that is Catholic is likely greater than the percentage of the U.S. adult population that is Catholic. In addition to these surveys, estimates are available from the Association of Statisticians of American Religious Bodies (ASARB). This organization produces county-level estimates for religious adherents of all ages that coincide with each U.S. Census. Adherents represent any members of the faith, regardless of attendance at services, confirmation, etc. The most recent estimates from ASARB represent the year 2000. Due to the timing of this data collection, the ASARB estimates, in some cases, misrepresent Catholic population percentages due to changes that have occurred in the last nine years—primarily any significant Catholic mobility (moving from one state to another) and any significant Catholic immigration (Catholics coming to the United States from other countries). Despite the methodological and timing differences between these four estimates of the Catholic population percentage (i.e. including the OCD), each is strongly correlated to all others at the state level (Pearson’s R >= .915). CARA has aggregated these Catholic population estimates by simply averaging them (Note: not all states have estimates from all four sources). This is represented as "Average" in the tables below. 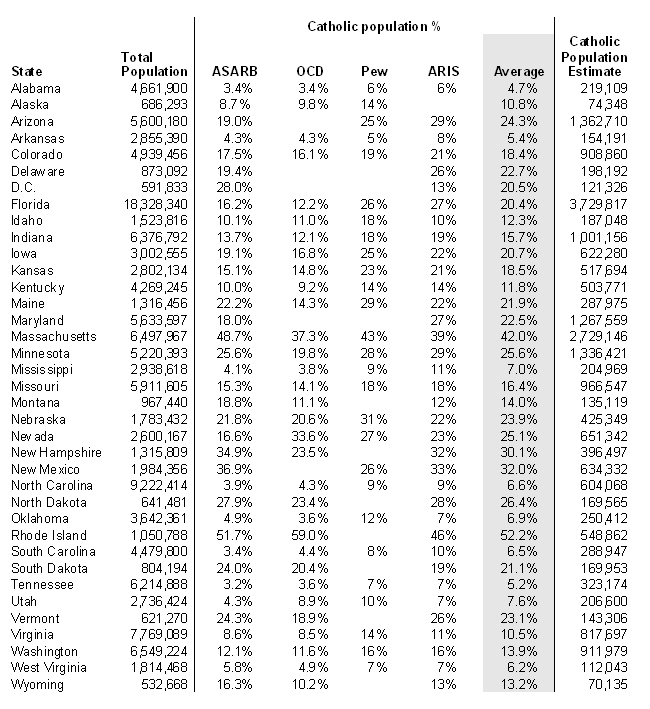 We use this average to estimate the total size of the Catholic population in each state based on U.S. Census Bureau estimates of state population size in 2008. 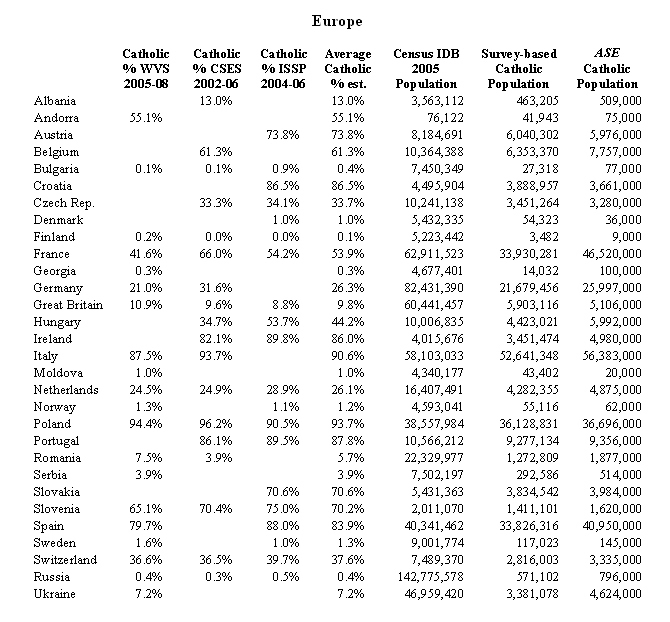 This is represented by "Catholic Population Estimate" in the tables below (i.e., multiplying the "Average" by the "Total Population" and creating the estimates in the "Catholic Population Estimate" column. Note: the "Average" includes additional decimal places not shown in the table. Thus, multiplying the table figures for "Total Population" by "Average" will produce slightly different estimates of "Catholic Population Estimate" than what is shown in the table. The complete data are available upon request). Using this method, the total estimated size of the self-identified Catholic population (i.e., adults and children) in the United States in 2008 was approximately 70.5 million (by comparison the OCD estimated this to be 65.2 million for the 50 states and Washington D.C.). This represents 23.3% of the total U.S. population of 303.2 million in that year. 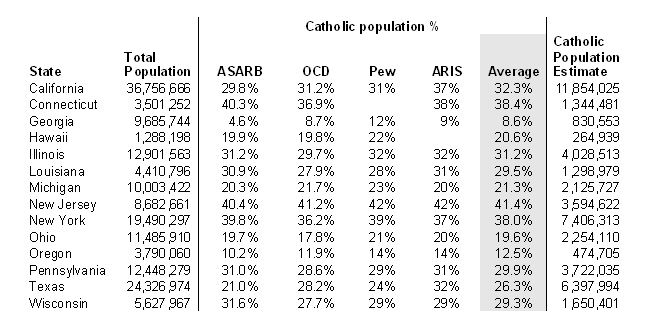 The table below includes states where the Catholic population percentage estimated from the OCD is relatively consistent with estimates made from the surveys and ASARB. The next table includes states where the Catholic population percentage estimated from the OCD is either significantly underestimated or overestimated in comparison to the estimates made from the surveys and ASARB. This table also includes those states where no OCD estimate is available due to diocesan boundaries (e.g., Arizona and New Mexico, Delaware and Maryland). The outlier states where dioceses have likely underestimated the size of their Catholic population are: Mississippi, Florida, Maine, North Carolina, Tennessee. In each of these states the size of the Catholic population is estimated to be more than 50% larger than what is reported in the OCD based on the most recent survey estimates. Florida in particular is estimated to have more than 1.4 million more Catholics than what is reported in the OCD (2,255,891 reported in the OCD compared to CARA's estimate of 3,729,817). The only dramatic outlier state where dioceses have likely overestimated the size of their Catholic population is Nevada where the estimated size of the Catholic population is 25% smaller than what is reported in the OCD based on the most recent survey estimates. Even the aggregated estimates shown above, for a variety of reasons, likely underestimate the Catholic population in general. As noted, ASARB is based on data collected in 2000 and the figures reported by dioceses in the OCD are often conservative and most consistent with ASARB estimates. The surveys by Pew and ARIS include only adults. Finally, one of the most difficult populations to survey and count in the United States are immigrants. Many recent immigrants to the United States have come from countries in Latin America and Asia that have large Catholic populations. Immigrants in general are known to be less likely to agree to be interviewed in surveys and may also be under-sampled due to the lack of a landline phone (i.e., mobile phone-only households). Researchers using Census Bureau surveys often make adjustments for this "undercount" (see Pew's, A Portrait of Unauthorized Immigrants in the United States). To the degree that Catholic immigrants are missed in surveys, the Catholic population percentages estimated using these data are by definition underestimated.